Tamiya 56030 RC Russian Heavy Tank KV-2 Full Option Kit Gigant from Tamiya. 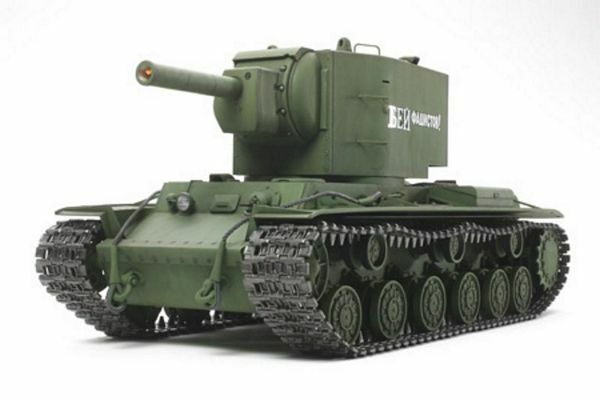 This is the TA56030 RC Russian Heavy Tank KV-2 Full Option Kit Gigant from Tamiya. After the success of the 1/16 R/C Russian KV-1 tank, Tamiya has released a second Russian Tank, the 1/16 R/C KV-2. In November 1940, mass production of the KV-2 began. The KV-2 tank was part of a series of Soviet tanks named after defense commissar Kilment Voroshilov. The large stature of the KV-2 was needed to house its 3.25m large turret, 24-caliber 1938/40 152mm M-10 howitzer and ammunition. This tank could hold 36 shells of various types of ammunition, including a special armor-piercing shell to attack concrete pillboxes. On June 24th, 1941 the KV tanks faced the German 6th Panzer Division in Lithuania. The massive size of the KV and 75mm thick armor was difficult for the German force to penetrate. German soldiers called the KV tanks Ungeheuer (monster) and Gigant (giant) because of their enormous size. 1/16 R/C assembly kit of the Russian Heavy Tank KV-2. Length: 443mm, Width: 210mm, Height: 205mm, Total Weight: 3,600g. The KV-2's large hexagonal turret and hull details have been accurately reproduced. Digitally recorded sounds: manually operated turret rotation, gun barrel elevation and depression, tracks and engine. Includes DMD Control Unit (T-08) and DMD Multi-Function Unit (MF-06) which enable turret rotation, gun elevation/depression, and realistic light, sound, and vibration actions. Turret can rotate a full 360 degrees while the main gun features a 4 degree depression to 14 degrees elevation range of movement. Precision-made turned aluminum barrel accurately reproduces the muzzle step on the barrel of the 20 caliber M10 152mm gun. Photo-etched parts to depict radiator grilles. Rear mounted, pre-assembled gearbox with two type 380 motors. Metal parts: lower hull, suspension arms, and drive sprockets. Requires 4-channel transmitter with self-neutral function (Futaba Attack T4VWD is recommended), battery pack, and eight R6/AA/UM3 batteries for transmitter. Separately available Battle System (Item 53447) enjoy 1 vs. 1 or team tank battles with other Tamiya 1/16 R/C tanks. Tamiya 56010 RC Tiger I DMD/MF01 Accessory Full Option Kit from Tamiya. Tamiya 56014 RC M4 Sherman 105mm Howitzer Full Option Kit from Tamiya. Tamiya 56016 RC U.S. M26 Pershing T26E3 Full-Option Kit from Tamiya. Tamiya 56018 RC King Tiger ProductTurret Full Option Kit from Tamiya. Tamiya 56020 RC Leopard 2 A6 Full Option Kit from Tamiya. Tamiya an RC German Panther Type G Full Option Kit from Tamiya. Tamiya 56026 RC German PzKw IV Ausf.J with Option Kit from Tamiya. Tamiya 56028 RC Russian Heavy Tank KV-1 Full Option Kit from Tamiya. Tamiya 56032 RC Super Sherman Full Option Kit from Tamiya. Tamiya 56035 RC Russian Heavy Tank JS-2 - Please call 305-279-8033 for your price. New items will be priced soon.